Thank you Cloud 9 for your great customer service, professional chauffeurs and well maintained luxury land yachts. I booked transportation for an event for my company. Transporting 40 passengers to and from an event. I received confirmations from the office staff fairly quick. I also received a courtesy email with the chauffeurs names and contact info the day of the event. Chauffeurs where about 10-15 minutes early for pick up. Both chauffeurs where well trained and extremely professional at what they did. We have this event every year. Great event with reliable transportation. Until next time....Great service Cloud 9! Awesome time in your 24 passenger Escalade! The chauffeur was very professional and new every winery we requested without asking us for directions. Thanks again for the great service and the competitive rate. I'll be calling again, Thanks Cloud 9! Great Limousine Service. 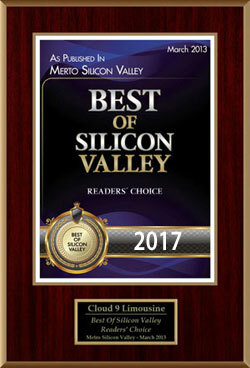 I've used many limousine companies around the US and cloud 9 limo is top notch. Had a fantastic chauffeur and well maintained vehicle. Thanks for great the great memories with friends and family. MAJOR shout out to cloud 9 and our driver Lois! We booked the hot pink limo for my 12 year old daughters birthday last night AND it was an awesome experience. Thank you John and staff for accommodating our wacky itinerary and for sending us Lois and his patience of a saint! The limo was clean, completely modern, and the lights and sound system were the bomb. It was a birthday that my daughter will never forget! P.s the moms can't wait to book this for a night out of our own! Just had Cloud 9 limo pick up my daughter and friends on the last day of school to take them out for lunch, dessert and a pool party. Our driver Roland was first and foremost a very safe driver, even explaining the safety equipment on board and what to do in an emergency. The limo was nicer than I expected, loved the blue colored lights and dotted starlights, the leather upholstery and carpets were clean and well maintained, the rag top roof was nice too, all in all very swanky! Our driver was courteous, professional and easy going with a group of very excited girls! He was great about me (aka mom) riding up front so I could still chaperone the girls while they could experience riding "alone" in the limo. The privacy panel was going up and down as the girls had questions or needed instructions with the radio or air conditioner, he wasn't phased at all with the disruptions and wanted to be of assistance whenever possible. I would definitely use Cloud 9 limo again, they arrived on time, brought a sharp looking limo with an experienced courteous driver who was safety conscience, it make for a fun filled afternoon! We were picked up yesterday at SFO by Cindy, the driver from Cloud 9 and were very pleased with her service!! She text me at the time my plane was landing to let me know she was there. She was very professional and nice, which really was a treat for the drive home to Santa Cruz. Their pricing beat all else that I had researched and found the service and the car to be top notch!! !No need to shop anywhere else and ask for Cindy. Used these guys for our wedding and they did a fantastic job. They worked with us on scheduling a few mini buses for picking up guests at the hotel, and then ran several shuttles all night long for guests to go back to their hotels. The drivers were on time, friendly and kept in communication with each other and me to give me the latest news (like when there were no more guests to pick up to bring to the wedding). You helped make the day! Thanks again! I used Cloud 9 for my wedding in August and I thought they did a great job. Robert was so helpful. He was very good about communicating with me and giving me different price quotes every time I changed my mind. Prices were more reasonable than some other companies I looked at. Cloud 9 transported my guests from the Sheraton/Westin in Palo Alto to Mt. Terrace in Woodside. Everyone was taken back to the hotels after the wedding. I want to praise one of the drivers in particular. I don't remember his name, but he has dark hair and an earring. First of all, I was running late (as usual) and I asked someone to tell Cloud 9 not to leave the hotel without a bride in the bus. I was screwing up the time schedule, but this driver still got us to the wedding location quickly and safely. Not only was he a great shuttle driver, but he was so cool and calm when dealing with my obnoxious drunk-off-their asses guests at the end of the night. I would definitely use Cloud 9 if I ever needed to rent a limo or bus in the future. Used Cloud 9 for my daughter's 18th Bday. I was totally satisfied from the get-go. They stayed in contact and the Limo showed up on the dot. The driver, Mark Z was awesome. The kids were completely happy with the service. Mark even called after the trip to let us know they were back at the drop-off. I would totally use them again! Luis provides 5 star service. He is customer service oriented...a true professional!!!!! We were totally impressed by Cloud 9 Limos. For our wedding, we rented both a limousine and a van to transport the wedding party and our guests to the ceremony and, afterwards, to the reception. Both drivers called the day before to confirm the details of our event, and arrived for pick up early (always a plus!) Both were also extremely skillful drivers (especially in light of the windy roads both to my in-laws' house and to the ceremony site itself). Steve (our van driver) in particular was just a fantastic, accommodating person. When we were leaving our reception, he helped us load our boxes of wedding supplies and clothing into the car. After he had dropped us off at our final destination (our home), he offered to take our maid of honor back to her house. THEN, when we realized that we had accidentally left my husband's cell phone in the van, Steve promptly and graciously drove all the way back to our house to drop off the phone. Given the horror stories we have heard about limo companies, we were just blown away by the professionalism and genuine kindness displayed by the Cloud 9 staff. Thanks, Cloud 9! I highly recommend this company!! I have used them more then once for different events. I've used there party bus and town car service and every time the driver always touched basis with me. There staff is on top of it & very friendly. I got the black hummer limo this last time & it was in immaculate condition!! I have never been in such awesome, custom limos like there's! I will call them the next time I need them for any transportation. You better believe you will have heads turning when you pull up in one of there vehicles! It's interesting to see the rating distribution on Cloud 9, but I have to say we had wonderful service last night with driver Mark Zhukov. The party was too large for a cab and the journey wasn't short, so the office priced out the transportation options and eventually settled on Cloud 9 for us. The price difference compared to some other limo services was quite remarkable, even for the car being at our disposal all night for as long as we needed it, and the rate gives them an extra star. I'm picky about things and so made special note that Mark's limo looked spotlessly clean inside. I'd use Mark and Cloud 9 again in a snap, a definite no-brainer. We used Cloud 9 Limo for our wedding on 7/13/13. Robert was an awesome help in our needs and found us the perfect Limo at a great price. The driver, Gary, showed up early and was professional and polite. He attended to me and my bride's needs. The Limo was immaculate and well maintained, inside and out. Their communication was great leading up to the wedding, which instilled confidence in me that I chose the right company. My hats off to the people at Cloud 9!!!! Hired Cloud 9 for a surprise wine tasting trip for my wife's birthday. Things could not have gone better. They were on time and the limo looked great. Our driver was absolutely fantastic. He did a great job of making sure everything went smoothly and treating our group like VIPs. He had the limo waiting for us the second we came out of each winery. Overall it was a great experience and very hassle free. I will definitely be using them again in the future. I booked a limo for my friends bachelorette party and I'm really happy with the service I received. The car was clean, they were on time and treated us really well. The driver knew our itinerary and got us where we needed to be on time. In the end we wanted the car a little longer and they helped us out. We had a blast! I will definitely use Cloud9 for future parties. Wow, just read other review - I had 100% the opposite experience. I used Cloud 9 for ground transport for 50+ guests and the bridal party to my wedding in Woodside, CA this past weekend (September). Their service, diligence, and follow through was perfect. I had all the confirmation emails, follow up calls for prep etc. One bus had a mechanical issue and was 15 min late, but like a smart / organized person does I padded the schedule by 15 min so it was a wash anyway. My husband said anything can happen with vehicles at anytime, preparedness pays off. Also there was some driver confusion on the what shuttles were coming, but it turned out that it was only driver confusion, all went well from headquarters. We had 4 vehicles total. They even sent a coordinator / supervisor in a separate car. Other service ie free waters, ice, driver's collection of CD's was great. I'll use Cloud 9 again anytime! The MOH for a friend of mine's wedding booked this for her bachelorette party. Ken was our driver and as far as I am concerned (as a guest) it was a well planned out evening. The shuttle is SOOO nice inside! Very spacious and I like how the flooring is not carpet, so if there is some spillage, easy to clean up! =) We brought our own cups so we wouldn't have to use their glass cups since we'd have to pay for any broken ones. I'd definitely book with them again if ever I need an awesome party bus/transportation. Especially if I can request Ken as the driver!!!!! I noticed that the previous 2 reviews were negative and I am sorry they didn't have a very good experience, however, I am basing my review off of my experience with this company which was very pleasant. We had booked the 22 seater excursion limo for our wedding. To our surprise the price was extremely reasonable. Other companies were charging about $1200-$2000 for us to rent the limo for a few hours, we only ended up paying about $600 for 5 hours with cloud 9, which was an UNBELIEVABLE DEAL! The limo was exactly what we had expected, We had a fairly large wedding party and surprisingly there was enough room to fit our photographer and videographer comfortably. Our driver Al was very nice and delivered excellent service. We got the red carpet treatment, champagne was complimentary, and the drive was smooth. In addition we were on a tight schedule since we went to different photo sites to take pictures within the city of San Francisco....our driver AL got us to every place on time and kept us updated every minute as to how we were doing with time. We were very pleased with the service we got from Cloud 9 and would definitely book with them again if we ever have the need to rent another limo. This review is LONG overdue (as in five years late, sorry! ), but better late than never right? My high school had its prom up in San Francisco and as per school district rules, we were required to use school provided transportation. The school had contracted with this limo company to provide limos to the students on a first-come, first-serve basis in terms of vehicles. I was lucky to get hold of the land yacht and was able to book it first. It was a phenomenal vehicle and the driver (can't remember his name, it's been five years, sue me!) was great and extremely funny. It was such a great way to get us hyped on the way there and give us a relaxing ride on the way back. Thanks to the the school booking the entire fleet, we were able to get a 15% discount. It was still pretty expensive mind you but it was worth it. It is a shame that limos companies get a semi-bad rep because of how expensive their prices are and the fact that they have to do a lot to make a great impression on their customers. I can only assume that that reason is why this company has gotten pretty low reviews. However, I can let you know that Cloud 9 Limos is great and will definitely make sure that you have a great start and finish to your night! We Bought the birthday package which was 14 passenger white Lincoln for 4 hrs. When I first called I spoke to Angelica who was nice and answered all of my questions. She emailed me an Authorization Form to fill out which i did then faxed it back. And then they email you a copy of the confirmation. It's kinda scary because after that, they tell you we'll be contacting you the day before your event... Which they didn't so I called them the next day to confirm the limo and I had to ask for the name and phone number of our driver, which was weird. I shouldn't have to be asking all these questions. We had George as our driver who was very nice. He did call to say he was going to be 5-10 minutes late which was good service even though he only ended up being 4 minutes late. Although online it said we'd be getting the 5th door limo, it only had the standard 2 in the back, no biggy it didn't really matter. I was the birthday girl so I didn't even make it into the club ha ha I was freezing and my husband didn't have a jacket but George let me use his as a blanket which was very thoughtful. Overall, I had a good experience through this company and plan on using them again. 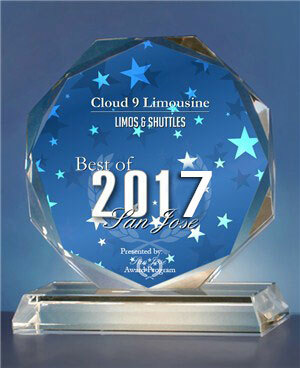 We recently used Cloud 9 (found through http://Limos.com) to arrange a transfer from SFO to San Jose for our newlywed friends who were returning from an international trip. We informed the driver that the flight was delayed by approximately an hour. The plane landed, passengers disembarked, and collected their luggage, but the driver was nowhere to be found. After dialing his direct number and getting voicemail, and then contacting the company directly, he finally contacted us after 20 mins. He indicated he'd be able to be at the airport within another 20 mins (presumably because he had to wait at an off-airport lot, I was told after speaking with Cloud 9). Overall, good customer service, but would've appreciated a bit more diligence on their part in monitoring the flight landing time/status and picking up the passengers promptly. I booked through http://limos.com, and it was provided by Cloud 9. The driver sent me a text message letting me know he was nearby, and to reply back when I had my bag. He smartly identified his car with a flag in the window, and picked me up curbside. Picking me up curbside was by choice, and http://limos.com did allow for other options. He was curious and professional. I thought it was odd he asked me for directions to my house, as I'd expect this to be something a professional driver would take pride in knowing. Regardless, I will certainly be using their services again. Note... I used their services from SFO, to my home in San Jose. Using a car service is dramatically cheaper than taking a Taxi, and certainly more comfortable. I surprised my husband for his 60th birthday with a limousine filled with 12 of his family members. I worked with David from Cloud 9 on making the surprise happen. When I called around Cloud 9 had the best price. I ordered a 12 passenger limo but I was worried with the size of the limo since height runs in our family and I was afraid we'd have no leg room! I didn't want to spend more money on getting a bigger limo! Cloud 9 surprised me by sending out their 20 passenger limo for the celebration. Limo was GREAT!!! --ice buckets were filled and glasses were everywhere! Matt the driver was super friendly -- he greeted us at all the bar/restaurant we had stopped at in SF with a umbrella to keep the women sheltered from the rain!! What a gentlemen!! I can go on and on saying great things! I even received a call the next day from the driver letting me know we left items in the limo! My experience was perfect renting from them!! I had an excellent experience with Cloud 9! I called around to find a party bus to go wine tasting, and they were able to match the lowest quote I had. I spoke to Robert many times over the phone and he was continuously helpful and accommodating. Luis was our driver and showed up right on time with an up-beat yet professional attitude. The ONLY reason I am giving 4 stars is because the bus ride was quite bumpy, for which Luis kept profusely apologizing. Apparently something was off with the rear shocks, but I'm sure it has been fixed by now, given how upset Luis was. He even waved off the extra fee of being an hour late to our drop off location. The bottom line: I'll be contacting Cloud 9 again for my transportation needs! Kenny was awesome. What a great job he did. Hope to see you again at another event. Ask for Ruben for a fine tuned, professional experience. We are repeat customers, because of him! He picked up our family for a limousine birthday experience for my daughter. The way Ruben treated her made for a day she will never forget. He is ultimately reliable for airport pick ups. Calls ahead of time so you have his contact info on your phone and can be confident that your ride will be there when you get to the curb! Cloud 9's email confirmations also include driver contact info. . . Really great.